I had an idea for a carrot and cardamon cake a while back, over the summer. I wanted it to be resplendent with rose petals but I never got around to trying it. 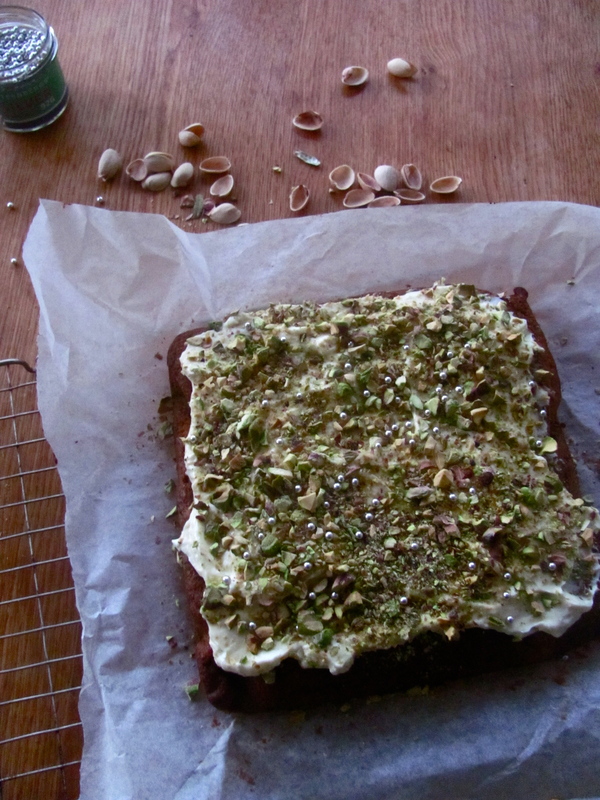 So this is the wintry version, adapted from a BBC Food recipe and made my own with the addition of cardamon and chopped pistachio nuts. This is a new favourite of mine – it’s lovely at 4 o’clock with tea or strong black coffee, and it would also be the perfect end to a Middle Eastern or Indian meal. – Preheat the oven to 180 degrees. Grease and line a square 20cm(ish) cake tin. Put the flour, sultanas, orange zest, cinnamon, baking powder, bicarbonate of soda and salt in a large bowl and mix until well combined. Beat the eggs until smooth. Add the sunflower oil and sugar and whisk until well combined. Make a well in the centre of the flour mixture and beat in the egg mixture until fully incorporated. Stir in the grated carrot. Pour the mixture into the parchment-lined cake tin and smooth the surface with a spatula. Bake in the centre of the oven for 35-40 minutes, until the cake is springy, well-risen and a knife comes out of the centre clean. Remove the cake from the oven, rest on a cooling rack and after about five minutes take the cake (still in its parchment) out of the tin and leave on the cooling rack for a good 20 minutes, or until completely cold to the touch. For the icing, sift the icing sugar into a large bowl and add the butter and orange juice. Beat together until light and creamy. Add the cream cheese and orange zest and beat until smooth. Taste it and add more sugar, orange zest or cream change as desired. Cover and chill in the fridge for 30 minutes or until firm enough to spread. Chop the pistachio nuts finely and sprinkle over the top.